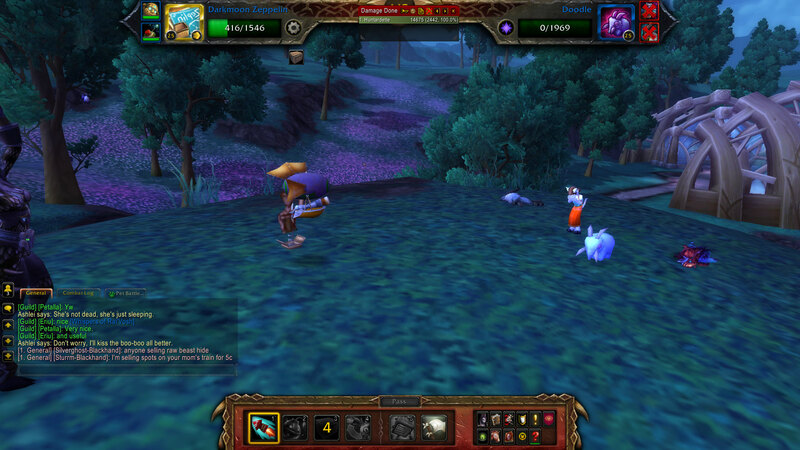 Found @ (50,31) in Arbor Glen (Shadowmoon Valley) and offers a daily pet battle with the following pets. Pet abilities can be found on the linked pages. Switch in Anubisath after initial hit on the magical elekk Doodle, since it typically swaps out and brings in Tally who does a stampede which does no damage through Sandstorm. Swap back in Dragonling to finish off the Elekk, as needed. You may not even need Anub to finish the battle. I'm not sure when to swap in the carry yet.. I forgot about it, but certainly didn't need another pet, so a carry of some kind should be safe, maybe when Doodle first comes out. Any pet you want to level/any pet you feel like in your third slot. Mechanical Pandaren Dragonling is your bread and butter for this battle, as its breath attack is strong vs two enemy pets, and it takes less damage from their magic attacks. This means you can ignore the weather change into Moonlight, and don't have to worry about having a pet on your team that can change the weather. Clockwork Gnome- BUILD TURRET and then hit it with a METAL FIST till it's time to build more turrets. When Doodle comes in - hit REPAIR. She will pull him out in two but you have all your health back.Totally solo'd all three pets. easy fight. my darkmoon zeppelin solo'd this on my first attempt with missile, bombing run, and decoy. This tamer is perfect for leveling pets: her elekk doesn't have any attacking abilities and the whole team can be smashed by Blingzinho or Zepelim de Negraluna or Gnomo Movido à Corda, sometimes even solo. Ashlei and her pets are easily soloable with a level 25 Rare Robô-foguete Azul de Corda. Spawn of Onyxia (P/P), solo'd all 3. Healing Flame when Doodle comes in, use Lift-off after Doodle sleeps, and just Tail-sweep otherwise. Cake. Goddamn this fight just makes me feel..... Bad! I beat all three with one pet, a level 25 robo-chick and he still had 1285 hp after the fight. Easily soloed by a lot of pets, but the great thing about Ashlei is how easy it is to boost a level 1. Use a pet with a self-destruct ability like the Dragonete Mecânico Pandarênico, have it solo the two live opponents, and self-destruct on the stuffed elekk. If you don't kill it with that, switch to your level 1 and spam whatever attack it has to finish the fight (If you do kill it with that, your back-line pets will share the experience even if they never came into play.). With no experience bonuses, it'll hit level 11. Don't bring a squeaky toy to a pet battle. All you need is a team of Shale Hatchlings and a back up sweep team. "Spawn of Onyxia" solo this battle. -Just use your 'Healing Flame' when off cd. Then you can bring 2 x lvl 1 pets to lvl. Just bring them out when the elekk plushie is out aswell - it will not damage your low-lvls! (elekk will be in for 2 rounds, then swapped to the Beast-pet)! Use Healing Flame when cd is off and Elekk-pet is in. First attack against the Beast is Breath, then use Lift-Off and finish off with Breath (more or less)! Did this pretty easily with my Molten Corgi and Direhorn Runt. Tried to use a Fire Beetle too but it was two-shotted by Tally. Easiest WoD tamer fight by far since bling is about 80g and takes a few hours to level to 25. This tamer is the easiest to beat out of all of the Draenor pet battle dailies. It's possible for a 25 Blue H/S Chama Vil to solo her, so that's the pet I recommend for this battle, because that lone Chama Vil can carry TWO level 1 pets. If you don't have a Chama Vil, you can tame one in Shadowmoon Valley (Outland). I recommend only one carry pet, though, because you can get a single battle pet up to level 24 every day by carrying it through 5 / 6 of the Draenor dailies if you have a Chapéu de Safári. Thankfully, you only need one strategy for each tamer, and I will be going through my 100% winrate strategies for every Draenor tamer, which you naturally can use every time. Open with Terra Queimada on Sininha, then just spam Sopro Flamejante until he's dead. Rabisco will come out next. Use your Sopro Flamejante a couple more times, but when Rabisco uses Nap Time, use your Conflagrar on the next turn, because Contabilidade will come out. You will be faster than him if you have an H/S Chama Vil. At this point, simply spam Sopro Flamejante, because if you have level 1s on your team, your Terra Queimada will kill them by the end of the battle. If you don't use it again, it should tick out by the time you pull your level 1(s) out. Like, my level 1s on this fight only take one tick of Terra Queimada's DoT every time, is how it usually works out. If you allow your Chama Vil to die, that is, which would most likely require that you pass a turn. If your level 1 gets all the experience from this battle, and you have a Chapéu de Safári on, your pet will instantly be leveled to 12, allowing that pet to survive long enough to get carried in the other pet battle dailies much more easily. Note that you can probably substitute a couple of pets here or there, but this is just what I used. Note also that each Draenor daily only requires two pets with my strategies, meaning you can use an Elekk de Pelúcia, or you could carry a single pet all the way up to 25. Another pet that can solo this team is the Kun Lai Runt with Frost Shock and Deep Freeze. When you 'freeze' pixiebell she will switch in doodle. Switch in a lvl1 and take attack once. Switch back to Runt and Shock-Freeze pixiebell again (Ashlei will have switched Pixi back in), switch to other lvl1 and attack. Back to Runt and finish them all off. Yula (1,1,2) can solo Ashlei's pets, leaving you able to bring in either Plushie, or two carry pets. breathe, breathe, breathe, emerald presence, allow Ashlei's dragon to life exchange, breathe for the last time to kill it. Her plushie comes in: breathe / breathe / use your own life exchange which will hit her talbuk in round 1. Use emerald presence again to completely block his stampede and then breathe him to death. Her plushie comes back in. You can breathe once or twice to get him low and then finish him off with your carry pets since he has no damage abilities. Editting to add: Yu'la can do this even while significantly lower level than the other team. I started using her while she was level 17, which is why I said to allow the dragon to life exchange. That step isn't necessary when she's level 25 and, in fact, the dragon should die on the 3rd or 4th breath, before it has the chance to LE. You can then breathe twice on the plushie and life exchange in anticipation of the talbuk, them emerald presence to prevent all damage. a few breaths and he'll die before he gets the chance to headbutt. Decoy, Breath x4, Pixiebell "is just sleeping"
If Doodle comes in Breath until Tally is swapped in. Tally will use Stampede which lasts 3 turns, so just use Breath and then Decoy before Tally's 4th turn, then Breath until Tally "needs some soup"
Swap in level 1 pet, use an attack, swap in your second level 1 pet, use an attack, swap your MPD back in and breath to victory. You can see the fight in this video here at 50:20." So this is my favorite pet battle to level up two level 1 carries (with mechanical pandaran dragonling in the first slot). However, as of 8.1, the alt that I have permanently parked here is not getting their daily quests reset. He is an engineer with a Blingtron 6000 as well and I cannot submit that quest either. Anyone else dealing with this? It appears that with the release of 8.1, Ashlei is no more. This nice girl, who has helped us raise our Battle Pets for so long, has become just part of the scenery. She is there, but the daily is gone. She was an effective way to level pets from 1 to 14. Thanks Blizzard! And now, there is really no reason to return to Draenor. Easily soloed with Nexus Whelpling (1 2 2). Derrote Ashlei em uma batalha de mascotes. Não gosto muito quando as minhas mascotes lutam, mas eu amo curá-las depois.